Synthetic peptide corresponding to KDEL. 293T, MCF-7, Raji, HepG2, HeLa, Jurkat, and K562 cell lysates. MCF7 and HeLa cells. Paraffin-embedded Human heart and kidney tissue. Our Abpromise guarantee covers the use of ab176333 in the following tested applications. WB 1/1000 - 1/10000. Predicted molecular weight: 25 kDa. The sequence Lys-Asp-Glu-Leu (KDEL) or a closely related sequence, is present at the carboxy-terminus of soluble endoplasmic reticulum (ER) resident proteins and some membrane proteins. 78 and 94 kDa glucose regulated proteins (GRP 78) and GRP 94 respectively and protein disulfide isomerase (PDI) all share the C-terminal KDEL sequence. The presence of carboxy-terminal KDEL appears to be necessary for ER retention and appears to be sufficient to reduce the secretion of proteins from the ER. This retention is reported to be mediated by a KDEL receptor. Immunocytochemistry/Immunofluorescence analysis of Jurkat cells labelling KDEL with purified ab176333 at 1/200. Cells were fixed with 4% Paraformaldehyde and permeabilized using 0.1% Triton X-100. ab150077, Alexa Fluor® 488-conjugated goat anti-rabbit IgG (1/1000) was used as the secondary antibody. 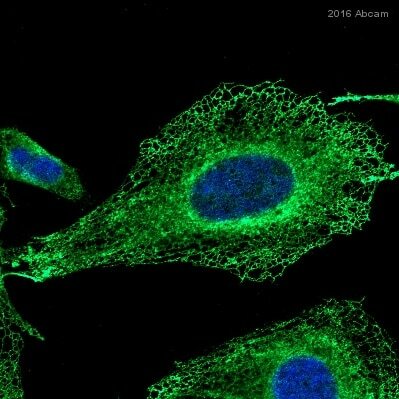 Cells were co-stained with ab7291, a mouse anti-tubulin antibody (1/1000) using ab150120, an Alexa Fluor® 594-conjugated goat anti-mouse IgG (1/1000) as the secondary. Nuclei were counterstained with DAPI (blue). 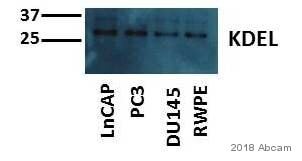 For negative control 1, ab150120 (Rabbit primary antibody) and anti-mouse secondary antibody were used and for negative control 2, ab7291 (Mouse primary antibody) and ab150077 (anti-rabbit secondary antibody) were used. ab176333 detected several bands which have similar MWs with some proteins containing carboxyl terminal KDEL motifs, including P4HB, GRP78 BiP, GRP94, PDIA6 and LEPRE1 (PMID: 25683117, PMID: 19741001, PMID: 22079671, PMID: 28648146, PMID: 22615817). It indicates that ab176333 might recognize these proteins. Immunohistochemical analysis of paraffin-embedded human liver sections labelling KDEL with purified ab176333 at dilution of 1:350. The secondary antibody used was ab97051; a goat anti-rabbit IgG H&L (HRP) at dilution of 1/500. The sample was counterstained with hematoxylin. Antigen retrieval was performed using EDTA Buffer; pH 9.0. PBS was used instead of the primary antibody as the negative control and is shown in the inset. Overlay histogram showing 4% paraformaldehyde fixed HeLa cells labelling KDEL (red) with purified ab176333 at dilution of 1/100. 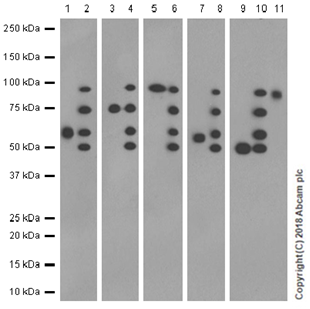 The secondary antibody used was Alexa Fluor® 488 goat-anti-rabbit IgG at dilution of 1/2000. A non-specific IgG antibody (rabbit monoclonal) was used as isotype control (black). The blue line shows cells without incubation with primary antibody and secondary antibody. Immunohistochemical analysis of paraffin-embedded rat kidney sections labelling KDEL with purified ab176333 at dilution of 1:350. The secondary antibody used was ab97051; a goat anti-rabbit IgG H&L (HRP) at dilution of 1/500. The sample was counterstained with hematoxylin. Antigen retrieval was performed using EDTA Buffer; pH 9.0. PBS was used instead of the primary antibody as the negative control and is shown in the inset. Immunohistochemical analysis of paraffin-embedded mouse liver sections labelling KDEL with purified ab176333 at dilution of 1:350. The secondary antibody used was ab97051; a goat anti-rabbit IgG H&L (HRP) at dilution of 1/500. The sample was counterstained with hematoxylin. Antigen retrieval was performed using EDTA Buffer; pH 9.0. PBS was used instead of the primary antibody as the negative control and is shown in the inset. ab176333 has not yet been referenced specifically in any publications. Publishing research using ab176333? Please let us know so that we can cite the reference in this datasheet.